It’s sunny outside and finally warming up. That means it’s the perfect time to gear up for some summer recreation outdoors. Care to join? 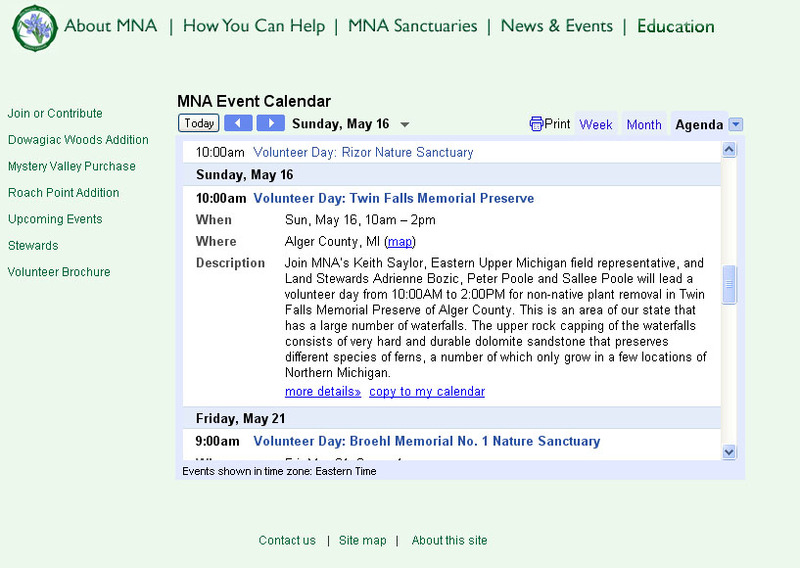 If you’re looking for Michigan Nature Association’s next outing, it’s all on MNA’s event calendar at: http://www.michigannature.org/home/how_help/calendar.shtml. Visitors can learn more about sanctuary walks and hikes, helping sanctuary stewards and MNA staff in the nature sanctuaries on volunteer days, trail dedications and more. Click on an event to find dates, times, locations and details about each activity. Once you have found your event, please R.S.V.P. by calling the MNA office at (517) 655-5655 or e-mailing us at volunteer@michigannature.org so we don’t leave you out of the fun. What botanists might consider the fairest may be the rarest in Michigan. Flowering plants top a list of extremely rare species groups in an analysis of endangered, threatened, extinct and special concern animal and plant species. They outnumber similar species in mammal, amphibian, reptile, fern and other groups by nearly two to one. But what is rare in Michigan may not be in other states or globally. 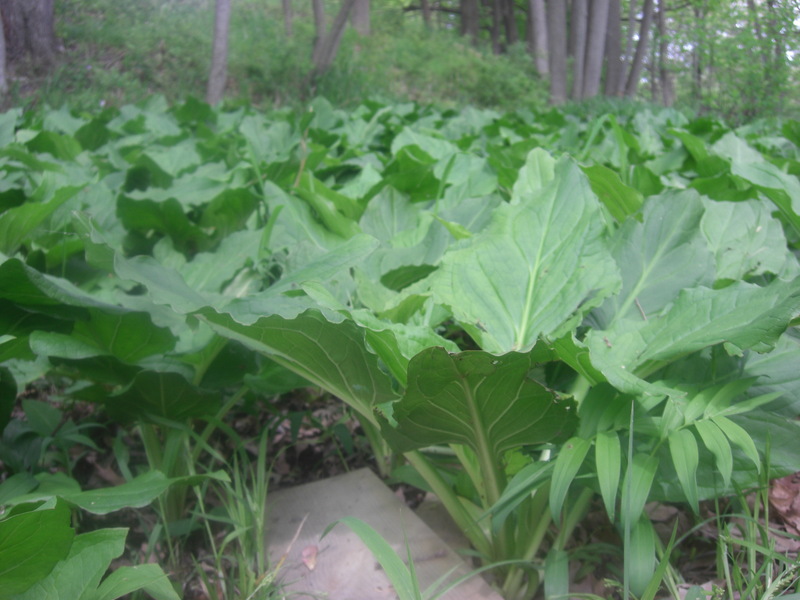 “The vast majority of our flora is decidedly common outside Michigan,” said Michael Penskar, the lead botanist for the Michigan Natural Resources Inventory, a group that tracks rare species. Michigan contains the edges of larger populations of plants that aren’t exclusively Michiganders—much of their population may lie in neighboring states where the plants don’t even make the rare species list. Flowering plants aren’t necessarily in danger because there are more rare species in the state, either. Penskar said there are more plant species on the inventory’s list because there are more plant species than animal species. Michigan supports 2,700 to 2,800 different plant species. “So if you have more to begin with, you’re going to have more that will be affected by human settlement and the like,” Penskar said. But that isn’t a reason to stop work to conserve them. “We should be concerned about what’s rare in our state regardless of if it’s very common…because that mix of species is part of our natural heritage,” Penskar said. More than 400 of Michigan’s 1800 native flowering plants are on the inventory’s list. Those facing extinction tend to be the most finicky, like the Michigan monkey-flower. “That’s the rarest of the rare for Michigan,” Penskar said. A perennial with tubular yellow flowers, the monkey-flower is only found in 12 isolated populations throughout Michigan. 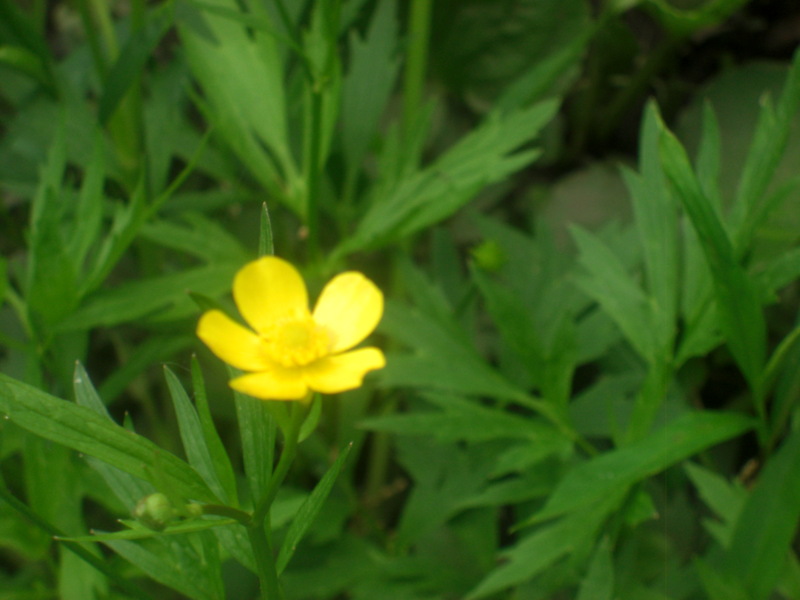 Penskar penned the monkey-flower’s 1997 recovery plan after it obtained endangered species designation in 1990. 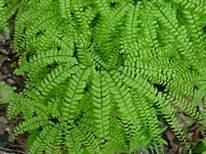 The plant is endemic—it has a narrow and specific range that includes the Mackinac Straits and Grand Traverse regions, according to a U.S. Fish and Wildlife Service document. But the monkey-flower remains rare in Michigan because it’s picky—it likes sticky, sandy soils near streams and lakes. All known populations are associated with the Great Lakes shorelines. There, the monkey-flower only likes cold, flowing spring water. 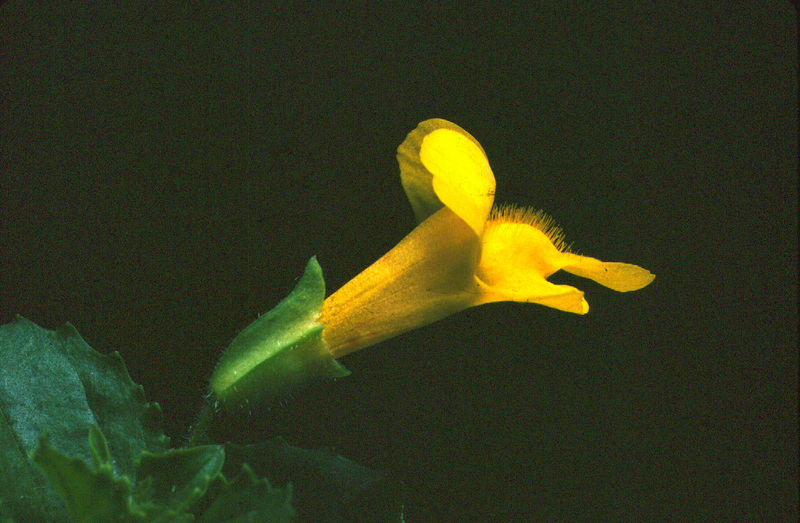 But with such specific needs, the monkey-flower’s greatest threat is habitat destruction and conversion. Off-road vehicles turn up the soil and destroy habitat. The lure of lakefront property has also left the monkey-flower in the dust as development progresses. Habitat destruction along shorelines has also proved to be a problem for Hall’s bulrush. Off-roading activity often increases when waters recede and create muddy conditions in its habitat, said Brad Slaughter, an inventory botany conservation associate. “They look really ugly and scarred when that happens, especially when they’re wet and you just end up with huge wheel ruts,” he said. And like the monkey-flower, Hall’s bulrush prefers its own specialized pad. Penskar thinks the bulrush could become the new monkey-flower in Michigan. 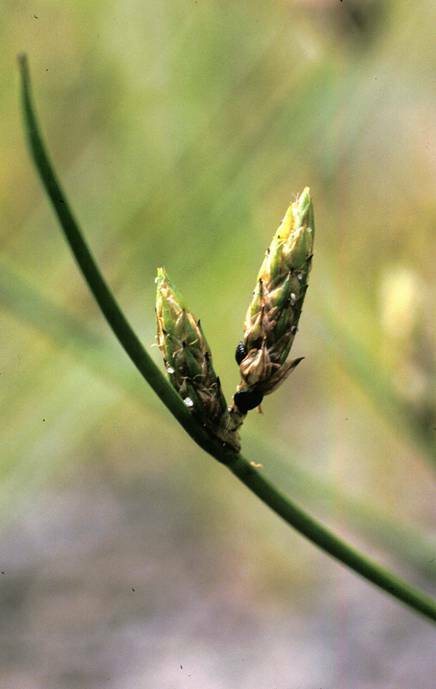 Hall’s bulrush is found in coastal plain marshes that aren’t very common. It occurs in southwest Michigan, northern Indiana and a part of Illinois. The marsh type it prefers is also specialized—it’s characterized by draw-down lakes or ponds, Slaughter said. “Usually in the late winter, early spring it looks like a lake or a pond but by the end of summer there’s no inlet or outlet to these systems. They’re pretty much just fed by the water table and precipitation so it’ll just draw right down and be dry,” he said. Some sites can remain dry for more than 10 years. Correlated with Great Lakes water levels and additional precipitation, these wetlands and pools become wet again. “The plants that grow in these systems have to be adapted to basically cycles of inundation and then what we call desiccation, or just drying,” Slaughter said. Hall’s bulrush can be elusive, though. “It might not even appear above the ground until conditions are right,” Slaughter said. Instead, Hall’s bulrush remains in a seed state. Slaughter said bulrush was last sighted in Michigan in 2002 and suddenly showed up in 2008-2009. Changes in groundwater or precipitation due to climate change could also spell trouble for the bulrush. But not all stories end with extinction. Recovery plans for Pitcher’s thistle were completed in 2002, though efforts to save the dune dweller began before then, said Tameka Dandridge. Dandridge is a U.S. Fish and Wildlife Service wildlife biologist who organizes agencies to implement recovery plans. There are many populations of the thistle in Michigan, Indiana, Wisconsin and Ontario, Canada. But Pitcher’s thistle is only found on shorelines or Great Lakes sand dunes. Dandridge said the fragmented locations of populations make monitoring key to ensuring they don’t disappear. She also said habitat destruction by off-road vehicles and invasive species are two factors that threaten the species. 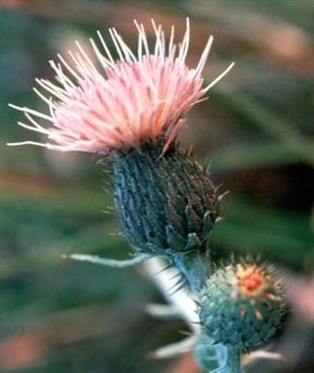 The thistle doesn’t produce seeds for more than five to 10 years. The seed is large and typically lands near the parent plant because it can’t travel on wind. Continuing recovery plans in each state, better landowner awareness of the plant’s needs and occurrences, along with hopes for continued monitoring to discover new populations and assess old ones could delist this species soon, Dandridge said. But Slaughter said the situation is not ideal. He said society tends to focus on those species that decrease and once a site requires actual care, it’s more than likely functioning at a non-sustainable level. Sometimes managers do find a management technique that turns habitats around. “There are those moments, just kind of like the stars in the night sky,” he said. And Penskar witnesses far more discoveries than wink outs on his watch. “We continue to find (new plant populations) in this state,” he said. group, common and scientific names and habitat types in which they were found. Story courtesy of Great Lakes Echo. They call them floodplains for a reason—water from the rising Red Cedar River made treading lightly on the plant preserve’s boardwalk an understatement May 17. 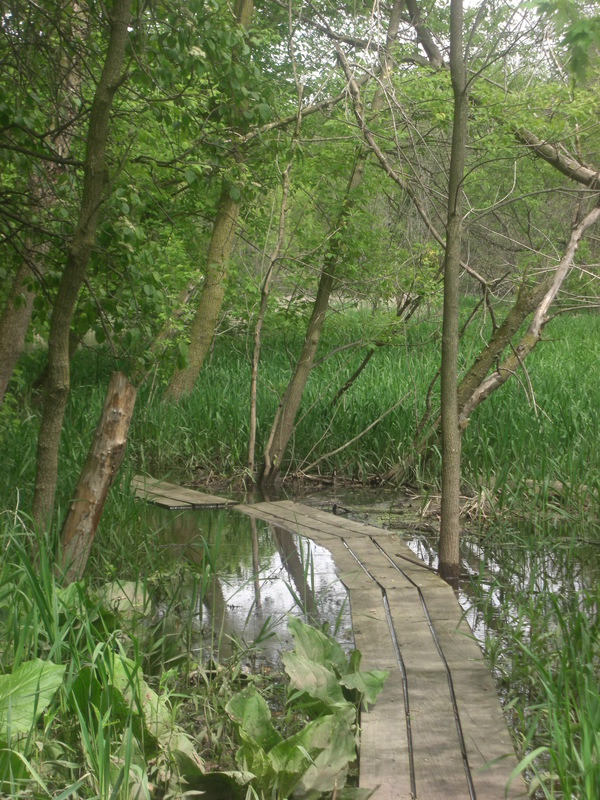 Though the event halted one intern’s hiking venture further into Michigan Nature Association’s sanctuary near Williamston, the floodplain and the preserve’s location near town make it unique. The site is one of five sanctuaries located within city limits. Nestled between two neighborhoods, the preserve shows the challenges and successes that come when city and natural lands meet. The floodplain and accompanying ridge were donated by Doug and Darlene Price. Doug, along with engineer Dave Geyer, worked with MNA to protect important parts of the habitat by changing development plans for the surrounding upland. A red-winged blackbird in Red Cedar River Plant Preserve. Those plans included protection of the ridge to preserve the river’s floodplain below. 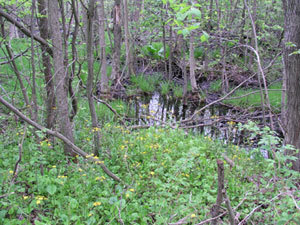 Now, native wetland species found in this area include marsh marigold, blue flag iris, skunk cabbage, jewelweed and blue beech. The ridge above the river is home to large black cherry and red oak. 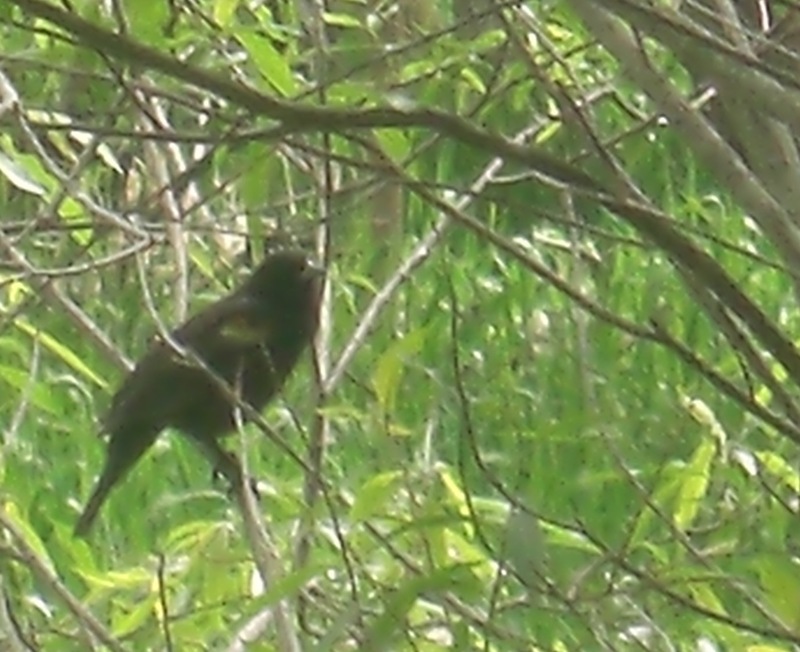 On the trip, a red-winged black bird flew upriver and perched on a tree branch. Take I-96 to the Williamston exit and turn right on Williamston Road/Putnam Street. Go through the stop light in downtown Williamston and turn right onto Church Street, which turns into Rowley Road. From Rowley Road, turn right onto Cedar Ridge Drive. Subdivisions dot the landscape of Orion Township, but one place was missed by development. 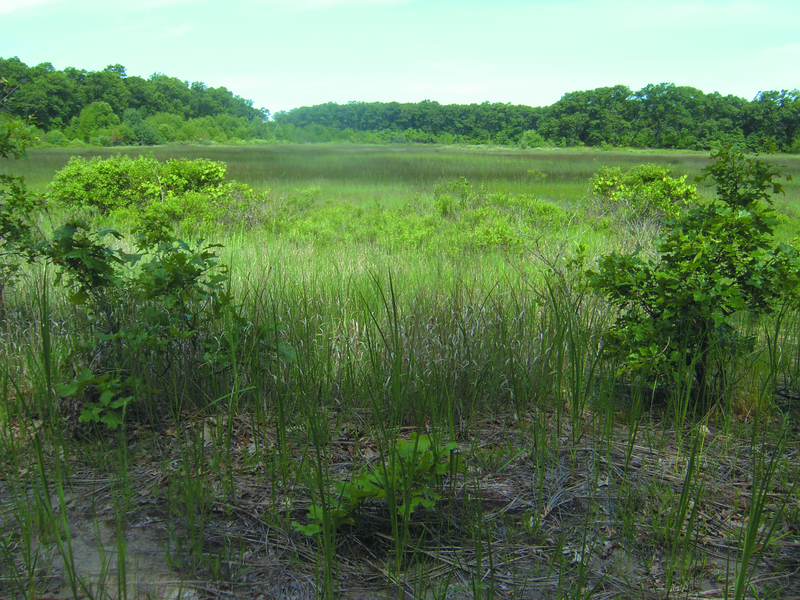 The Morgan Porritt Plant Preserve in Oakland County consists of about 7.75 acres of cedar swamp and forested wetland, with areas of upland forest. The native plants that grow in the preserve include some of the oldest plants in the world in terms of evolution. The preserve’s warm, moist conditions are similar to those present millions of years ago, which supports ancient plant types. Some of the types of liverworts, mosses and ferns were here before the dinosaurs. Though Morgan Poritt is located in the path of rapidly developing Metropolitan Detroit, there are still many high-quality parcels of natural lands nearby. The forested wetland and cedar swamps that exist around the preserve benefit the surrounding residents not only as places to visit and a refuge for native plants and animals, but also as important water-filtration and flood control areas. Despite loggings by settlers in the 19th century, the wetlands remain and the forest cover has regenerated, providing heavy shade to the ground even on a sunny day. The swamps and wetlands in the township have provided refuge for wildlife and for the many native plants that grow in the moist shady habitat, sheltered by the cedar, yellow birch and other trees that make up the canopy above. Butterflies are blossoming in Michigan as spring makes way for summer. Among them is a small, native butterfly with a big, blue color. The Karner blue butterfly is an attractive little creature with a wingspan of about one inch. It is roughly the size of a postage stamp. Males have a vibrant blue color on their upper wings and a single row of metallic blue-green, orange and black spotted rims on the outer edges of their wings’ underside. The upper surfaces of the female’s wings are blue close to its body and fade to a gray-brown at the edges. The Karner blue feeds on the nectar of a variety of flowers such as lupine, New Jersey tea, dogbane and butterfly weed. Larvae of the Karner blue feed only on wild lupine leaves and flowers. 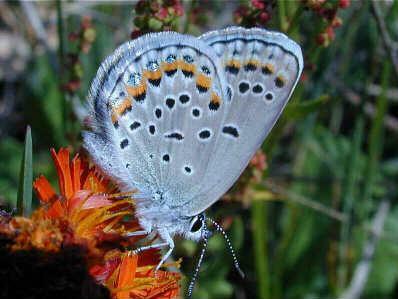 Due to the larvae’s specific diet, the female Karner Blue only lays her eggs on or near lupine plants. After hatching, the young caterpillars feed on the lupine and form a chrysalis after a few weeks of feeding. Adults emerge in about ten days. Two generations are produced each summer. Michigan lupine can be found in various oak savannas, oak-pine barrens and other open areas containing sandy soil, according to the Michigan Natural Features Inventory. But many of the habitats conducive to lupine survival are in decline. Once ranging from Maine to Minnesota, the Karner blue butterfly has been reduced to small populations in Indiana, Michigan, Minnesota, New Hampshire, New York and Wisconsin, according to a U.S. Fish and Wildlife Service report. In Michigan, the historical distribution of Karner blue butterfly was widespread in the western and southern Lower Peninsula, but populations declined as the amount of habitat available for lupine was reduced. This reduction was the result of development, agriculture and fire suppression. The inventory said before the arrival of European settlers, fire was essential in maintaining prairies, savannas and barrens. Periodic fire killed trees and shrubs, allowing other ground forbs like wild lupine, butterfly weed and coreopsis to grow. Today, these fires are very rare and other trees and shrubs have invaded the butterfly’s natural habitat, shading out many ground plants. The Karner blue butterfly is listed as a federally endangered species and as threatened in the State of Michigan. Today, it persists in remnants of savanna and barrens, degraded openings, old fields, and utility and highway rights-of-way. Reintroducing fire through prescribed burns will help maintain remaining savanna areas. Federal, state, and private landowners are partnering in various habitat management practices to maintain Karner blue habitat. The Toledo Zoo is also studying techniques to breed the Karner blue in captivity for later release into the wild. If you’re looking for a nature fix to kick start your summer, look no further than Michigan Nature Association’s annual Members’ Meeting May 8 in Lenawee County. Family and friends are welcome to join members in food, fun a recount of MNA’s past activities and discussion of its future endeavors. This event is open to the public to encourage awareness and combined preservation efforts of Michigan’s natural habitats. The meeting will also provide MNA members, staff and the Board of Trustees from around the state with a unique opportunity to connect and experience the MNA’s mission together. This year’s event highlights include a presentation by guest speakers Dr. Forest Haines, professor of earth sciences at Adrian College and Misa Cady, lunch with friends and fellow members and a choice of two guided field trips to MNA’s Goose Creek Nature Sanctuary or Frances Broehl Memorial # 1 Nature Sanctuary. Lodging and local dining are nearby in Brooklyn, Mich.
Attire: Goose Creek Nature Sanctuary is predominantly a wetland and the Frances Broehl Memorial #1 Nature Sanctuary has some wet terrain. Therefore, dress casual but it is highly recommended that you wear or carry a light jacket and a pair of mud boots for the sanctuary field trips. Contact the MNA at (517) 655-5655 or email michigannature@michigannature.org to let us know you’re coming or if you have any questions.